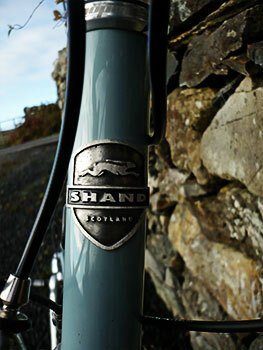 the shand cycles skinnymalinky sort of gives the game away by virtue of the name scratchily painted on its top tube. unlike the modern carbon wonders and the memories of aluminium, the reynolds 853 tubes are of more modest proportion, offering a bicycle that is most pleasing to the eye. according to steven shand "The first Skinnymalinky prototype we designed and built was a bit different. 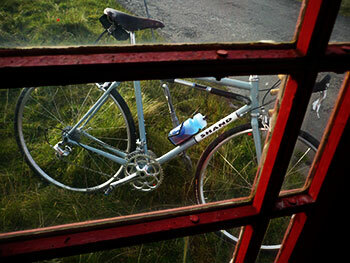 It had a wishbone rear triangle, unicrown forks, forged dropouts and a sloping top tube, compact geometry. I liked it but Russ (Stout, the other partner in Shand Cycles) thought it was maybe a little to modern." I'm sure my thoughts on modern have been made all too plain over the years, but i can't help but admire the fact that the skinnymalinky looks marvellously contemporary despite it's traditional roots. "The Skinny was actually supposed to be our first production bike. 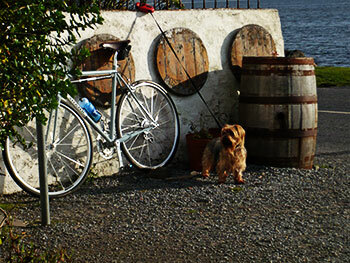 It was the bike we felt was missing in the UK/Northern Europe market. We were both sick of seeing brochures and websites with pictures of silky smooth, sun baked, rolling roads. That seemed so different from the kind of riding we do here in the UK (and more specifically, Scotland). So our wish list for a road frame started with something that was durable, comfortable, had clearance for 'bigger' tyres and mudguards and above all was practical. But what we didn't want to lose was the fun factor of riding a lightweight race bike. 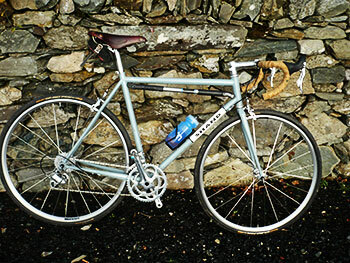 This wasn't supposed to be a touring bike"
despite mudguard eyes and clearance for 28mm tyres, the skinnymalinky is unlikely to be mistaken for a touring bike or, indeed, an audax machine. true to the house style, each tube is mitred and fillet brazed in position to the extent that each tube appears to flow into the next. perhaps the only nod to modernity would be the straightness of the steel forks, for the thin top tube is most definitely not sloping, though the seat tube shifts just a smidgeon past being level. a wishbone chainstay miight fit seamlessly into a carbon frame, but somehow i cannot imagine the frame without its two slightly swoopy seatstays the confluence of which meeting the chainstays offers vertical dropouts rather than the possibly expected more traditional horizontal road option. it must also be recorded at this point, for 'tis of great importance on any bicycle frame, but especially on a handcrafted steel example, that the skinnymalinky sports a real head tube badge. if you're looking for just one more reason to push you into owning one of these, this is surely the salient feature. 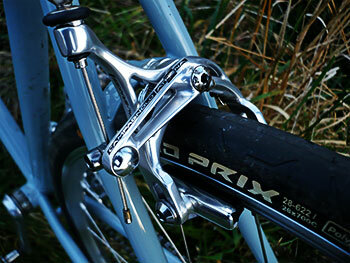 a second much-revered point in favour of its classic qualities is that of a braze-on front gear mech. these are found all too infrequently on road bikes in my opinion and is a most welcome element on the skinnymalinky's seat tube. shand carry out all their own painting in-house to an impressive standard. 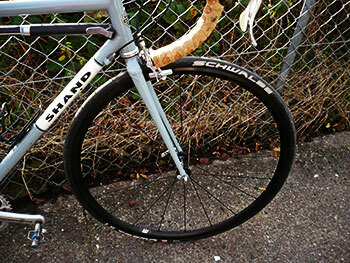 the review model arrived in a beautiful shade of grey, with a traditional style white panel on the down tube on which the name shand proudly resides. the gear cables head towards the fillet-brazed bottom bracket shell via guides at the top of the down tube. similarly the rear brake cable eschews any form of internal routing, taking the more traditional route along the underside of the top tube. the headset is the now traditional 1.125" diameter a-headset, in this case from hopetech, matched with a polished alloy ritchie 120mm stem, holding onto a pair of matching ritchie bars. these claim to be classics, but in fact adopt a parabolic curve, rather than the proportions of the traditional handlebar. 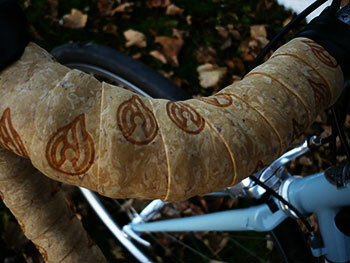 the bike's heritage is referred to with cinelli embossed leather style bar tape. 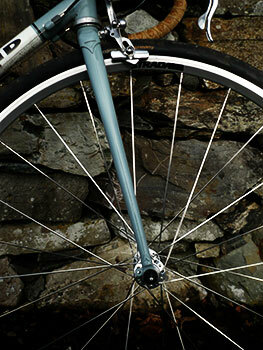 the polished alloy of bars and stem are matched by a ritchie twin-bolt seatpost. i fitted my own brooks team pro saddle for the review period and i do have to wonder why there are so many variations of seatpost fixing methods, as opposed to the single rear bolt that i believe campagnolo still use to this day. ritchie has placed the bolts one on each side of the post rather than fore and aft making it something of a footer and faff to fit for what i perceive as no particular benefit. all that shines is reflected both literally and figuratively in the strada built wheels. the rims are strada badged matt silver alloy, but the hubs are of highly polished alloy from white industries. i already run a pair of these hubs on the ghisallo wooden rimmed wheels from sugar wheelworks in portland. they're amongst the very finest and certainly the shiniest on the market. in keeping with steven shand's contention that the skinnymalinky is endowed with excellent tyre and mudguard clearance, the continental grand prix tyres were of a 28mm width and not even close to the chainstays or fork legs. impressive. brakes were campag athena skeleton calipers, yet not of a deep drop variety, making the tyre and guard clearance all the more impressive. 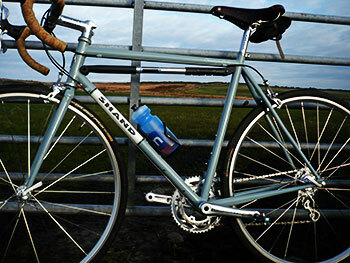 my chris king cielo, which has a similar purpose to the skinnymalinky uses shimano calipers of non-standard (longer) depth allowing the same clearance for 28mm tyres coupled with mudguards. that shand have managed this without resort to non-standard components is a smart move. with so many of the modern day groupsets owning substantial amounts of carbon or anodised alloy, it was something of a joy to find the shand replete with a campagnolo athena eleven-speed groupset, the all polished alloy version. though carbon brake lever blades tend to be warmer to the touch on cold mornings than bare aluminium, at this point of the year, my fingers are usually encased in winter gloves and the touchy-feely factor becomes purely academic. the campag cassette was of 12-25 composition married to a compact 50/34 chainset. in an attempt to encompass the bicycle's versatilty, i opted to fit my own crank bros. eggbeater pedals. that way i have no need to emulate a duck when stopping for coffee. though the chaps at shand cycles primarily sell the skinnymalinky as a frame and fork set, they are generally kind enough to offer a build kit, should you be either incapable or unwilling to carry out this part by yourself. thus, although the basis of this review is just the frame and forks, that which is handily attached has considerable bearing on how the steel tubing presents itself to the general public. scotland's roads, by and large and by common consensus, are hardly billiard table flat, while the island principality has the added benefit of sporadic cattle grids of varying temperament. though nothing to be particularly proud of on a daily basis, it cannot be thought otherwise than an excellent testing ground for anything of a velocipedinal nature. when matching frame and wheels, i had been paying less attention that might have been more astute and was of the impression the continental tyres were of 25c cross-section. not so; steven and ross had gone one greater than that and shod the strada wheels with a 28c width. having had recent experience of 28c tyres on those beautiful ghisallo wood rimmed wheels from sugar in portland, the portent of riding on a cushion of air held an appeal possibly entirely in proportion to the benefits. in truth, riding the skinnymalinky in this tyred fashion (see what i did there?) was almost stately. so finely honed is the positioning on the frame, that it gives the impression you could be clouted by a volvo without actually falling over (don't try this at home). the stability was almost palpable as indeed was the comfort factor. since i'd little difficulty keeping pace with the sunday morning peloton, there were occasions when i wondered why we don't more regularly opt for 28mm tyres. or perhaps we do, and it's just that nobody's bothered to tell me? though the quality of the fillet brazing makes it hard to reconcile the bike's constitution as that of steel, it's hard to conceal squeals of delight at such narrowness of tubing. that might be considered retro, but as of yet, i'm not sure anyone has proved that to be a bad thing. in a bout of unexpected cleverness, the shand exhibits not only the aforementioned stability, but a rather surprising degree of agility, particularly on tight twisty roads. granted, the tyres do remove just a smidgeon of feedback and prescience, but everything has its compromises. in my now almost legendary manner of non-scientific appraisal, i adjusted the rear brake shoes as close to the rim as it was possible to go without causing any rubbing. continuing this heath robinson approach to its ultimate extent, i then wellied it up an 8% gradient in as big a gear as my chris hoy thigh muscles would allow. no rubbing at all. similarly, attemepting the same operation in the outer ring, albeit at a slower velocity gave rise to no chain rub on the front mech. in truth, had either of these tests proved negative, i'd have been less than overly concerned. 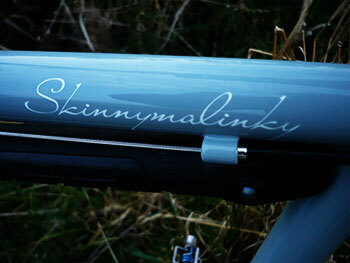 shand have positioned the skinnymalinky as one for " fast, long miles." it is not specifically aimed at being a race bike, and i think it likely that a modicum of brake or chain rub in extreme circumstances unlikely to be of principal concern. in practice, it never was. the second part of this tale was occasioned by a eureka moment on being all too aware that here was a scottish built frame that might acquire more scottishness by fitting the wheelsmith race23 wheels concurrently in for review. i opted to leave the ultremo 23c tyres on these in order to filter out whichever factor was responsible for the skinnymalinky's comfort factor: frame or tyres? sometimes serendipity has a fire in its tail. though 28mm tyres have less of a drag factor than could reasonably be expected, the 23mm schwalbes removed that pretty much entirely. 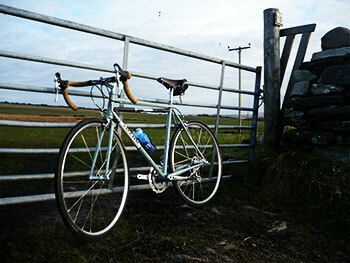 however, what i had not expected was the ability of the wheelsmith race 23s to expose the shand's inner colnago. 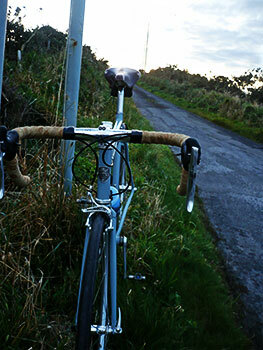 the approach to bruichladdich village, and thus debbie's cafe is constituted of a number of twisty, off-camber bends. supported by a desire for cappuccino and a reasonable tailwind, a fast swish through these corners and bends was exhilarating to say the least. in fact, i'd go so far as to say that in this format, the skinnymalinky has easily taken on the mantle that we'd more readily apportion to italian built steel. i have a sneaking suspicion that the skinnymalinky is around two degrees of wow better than even steven and russell think it to be. it also turns out that those original 28mm tyres, while undoubtedly contributing to my personal comfort, were not solely responsible for that important factor. the wheelsmiths own fewer spokes, incuding a radial front build and i had the ultremos inflated to 100psi. though i cannot deny i now had to stand when rumbling over cattle grids, steven shand has managed to equal colnago's legendary ability to combine comfort and untold agility in a single 853 constituted frame. but what of everything else, i hear you ask? well, to be honest, everything else really only consists of that eleven-speed campagnolo athena groupset, one that is an emphatic reminder of just how good campagnolo's shifting really is. shimano almost rules with its ubiquity, while sram features well as an almost quirky alternative to the latter, but in truth, campagnolo has this whole gear shifting thing well and truly nailed. 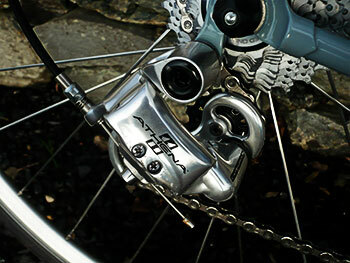 over the entire review period, the athena rear mech never missed a shift, and such was my eagerness to got out riding, i had failed to check the setup after bolting the rear mech in place. it seems something of a truism that the precision offered by eleven rear sprockets will be a tad harder to dial than ten, but if that's the case, it has never made itself known. shifting both up and down the block is rarely as transparent as the soundlessness of shimano, but does offer a more satisfying and tangible report that gears have been shifted. that is allied to an impressively light pressure required at the lever end, one that, due to separation of function between three separate levers, never interferes with smooth modulated braking. what was initially confusing is campagnolo's almost wholesale shift to torx bolts, a move that has gone hitherto un-noticed this far from urbanisation. i went through a selection of several allen keys while trying to connect the rear mech before realising the error of my ways. chainring bolts i have had previous experience of, but mechs and now brake bolts had me scrabbling for a little used set of torx keys. italian progress i suppose. if i might, for a moment, transfer my moderated ire to that of contemporary handlebar design, i think ritchie to be somewhat flattering to deceive. both bars and stem are branded as classic, one that i'd take to suggest the more traditional style bars with a semi-circular curve ending in a flat lower portion. the anatomic parabolic curve pulls rather sharply away from the brake lever blades, meaning that any substantial time in the drops (lengthy descending, for instance) can and does cause discomfort on the thumbs if necessary to feather or grasp the brakes in a hurry. if you've ever ridden the road from craighouse in jura back to the ferry over the lengthy downhill, peppered with unpredicatble sheep, you'd know of which i speak. the apparent resurgence of the steel handbuilt frame is not just a media invention, but it's certainly a case of taking many years to be an overnight success. steven and russ didn't just wake up last week and figure this was a good idea; the skinnymalinky bears more than adequate testament to that. this is a bike that fulfils most of the expectations of one that might conceivably be chosen as a do everything machine. 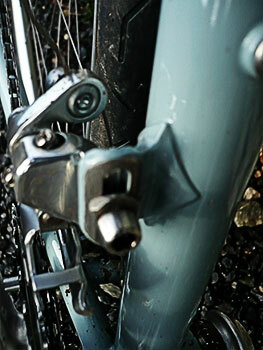 the fact that there is more than adequate clearance for mudguards, and as demonstrated, 28mm tyres (featuring mudguard eyes on both front and rear dropouts) will undoubtedly allow the intrepid owner who head up long-forgotten tracks criss-crossing farmland and even gravelly offroad in places. if there is any justice in the world, by this weekend there will be a lengthy but orderly queue outside naismith court in livingston waving flexible plastic and open chequebooks.